Shipston Self Storage are an existing business who already had a website which they felt needed an update. They approached Pedleyonline to talk through their ideas and we produced a proposal and estimated costs. Once agreed, the first step was to work on a new logo for Shipston to use on the website and other media. We developed a small number of simple logo design concepts and sent them over for feedback then revised and refined them until we had something they were happy with. The website has been developed in WordPress which has great flexibility and options for functionality. It is a responsive website which means it works on all types of devices, including mobile phones, tablets and desktop computers. The website is clear, easy to use and can be expanded at any time to include new content. The content is relevant and unique and focusses on the services they provide in their local and target areas.At the point of going live with the new website we made sure that no traffic was lost and website visitors were transported safely from the old URLs to the new website. 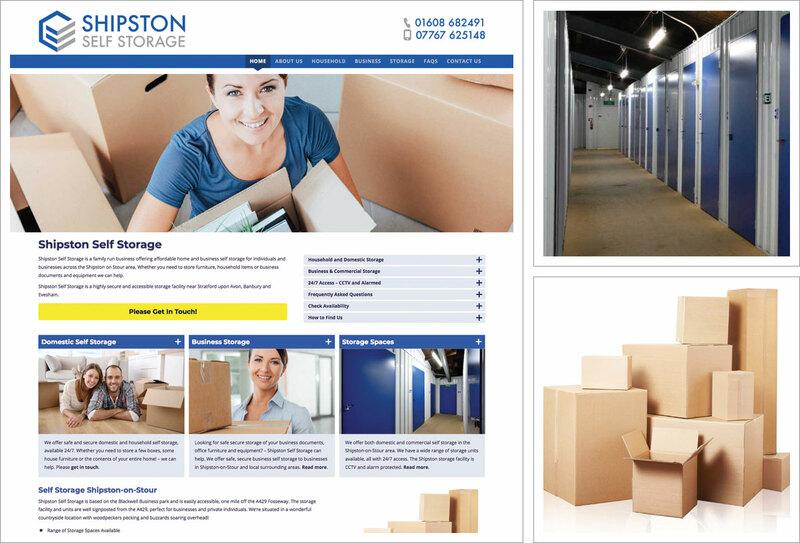 Following the launch of the new website we went on to help Shipston Self Storage develop business cards and leaflets featuring their new branding and logo.